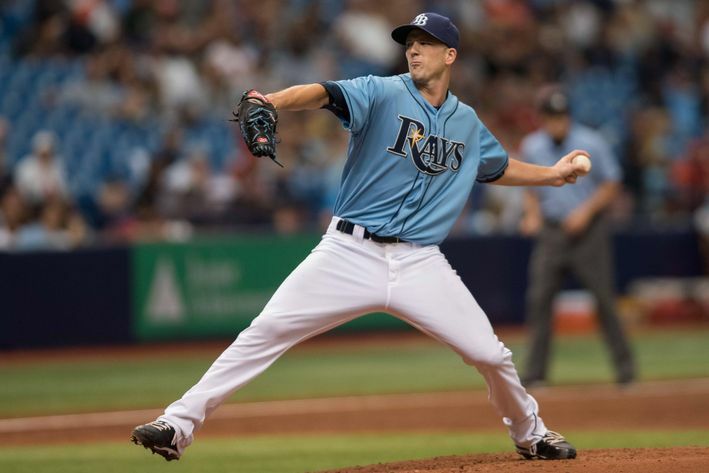 The Tampa Bay Rays took a 3-0 in the second and third innings on Saturday, and held on for a 3-2 victory over the Yankees. 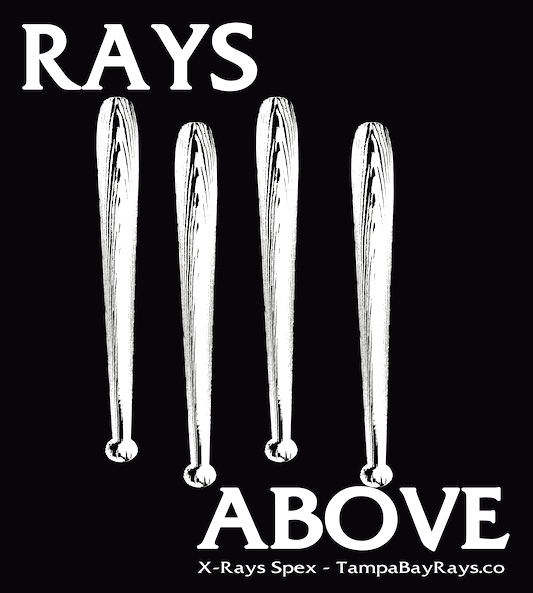 All three of the Rays runs came with two outs, as Tampa Bay handed Nathan Eovaldi his first loss since June. Tampa Bay (67-68) is now 3-2 on a nine-game trip after splitting the first two games against the Yankees. Tampa Bay got on the board in the second inning after Logan Forsythe lined a one out double to left. Asdrubal Cabrera worked a walk, and after James Loney went down swinging, Kevin Kiermaier hit an RBI grounder through the right side to bring home Forsythe, putting the Rays in front by one. That lead was extended to three in the second. Eovaldi walked two batters before plunking Evan Longoria with a 98 mph fastball on his right forearm. With two outs and the bases loaded, Cabrera lined a two-run single to right, giving the Rays a three-run advantage. Longoria left the game three innings later because he had trouble gripping the ball. I felt like I was a liability out there, he said after the game. It actually feels a lot better now after some treatment and ice. I’m fairly certain I’ll be able to go (Sunday). 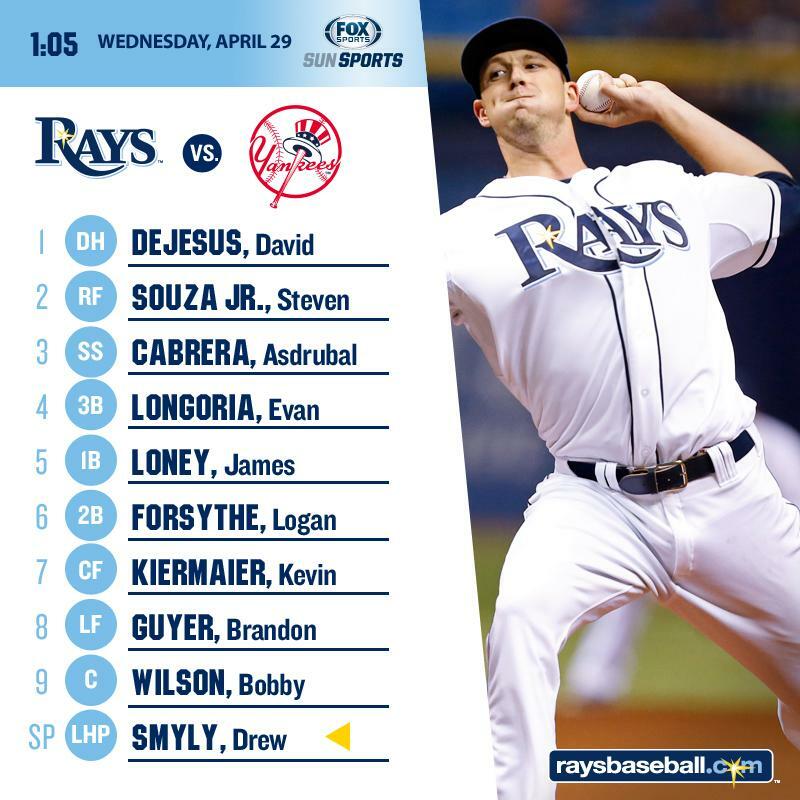 He’s listed as day-to-day, although Longoria expects to start in the series finale this afternoon. On the other side of things, LHP Matt Moore made his first start since returning from Triple-A Durham. Moore was sharp early, especially the first time through the order. 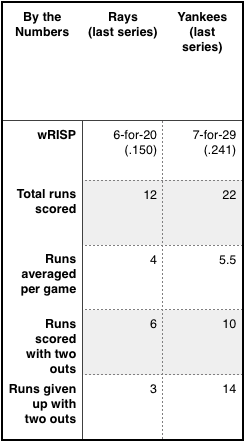 The lefty pounded the zone with a zippy 92-94 mph (topping out at 95 mph) fastball, and allowed only three base ­runners to reach through the front four inning ― making crisp pitches and working with a quick tempo all the while. Yet Moore got into trouble in the fifth inning, resulting in an early hook. He allowed his first walk (John Ryan Murphy) to start the inning, then Didi Gregorius followed with an RBI double to left-center, scoring Murphy and putting New York on the board. A pair of groundouts scored Gregorius, and after Moore walked Chris Young, the southpaw’s day was done. Brandon Gomes took the mound in relief, and the righty got Carlos Beltran to line out to center after allowing a free pass to Alex Rodriguez. I thought he (Moore) was outstanding. I was happy for him. In my opinion he looked like a different guy as far as the way he continued to pound the strike zone. He got a lot of swing and miss on fastballs. He got a lot of swing and miss on the curveball. … That was a definite bright spot to see where he is right now. Xavier Cedeno followed Gomes and hurled 1-2/3 innings of scoreless baseball, fanning the side in the sixth, and getting the first two outs in the seventh before giving way to Alex Colome. Colome struck out Jacoby Ellsbury on three pitches to end the seventh. Then in the eighth ― after coaxing two quick, hard-hit outs ― Colome allowed a pair of hits and a walk to load the bases. 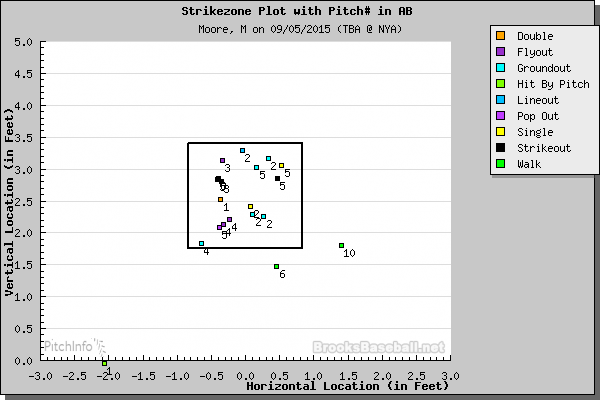 However, with the bases loaded and the Yankees’ game on the line, Gregorius slashed a hard liner right at Forsythe at second, ending the threat and the inning. Cash said it was good to see Colome get into and out of trouble, seeing it as a confidence booster for the righty. Brad Boxberger closed out the game by tossing an impressive 1-2-3 ninth for his AL-leading 34th save. 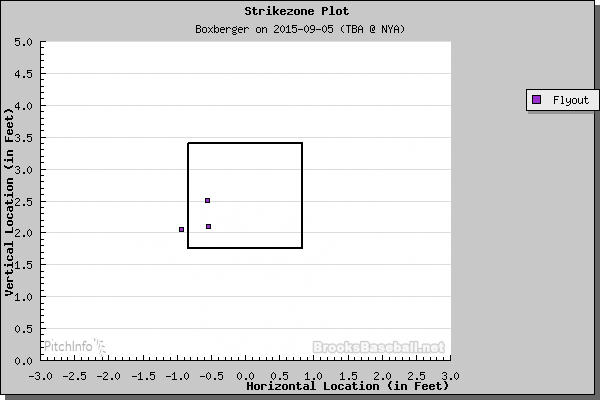 Boxberger coaxed a triplet of weakly hit fly balls on three well located 93 mph fastballs. 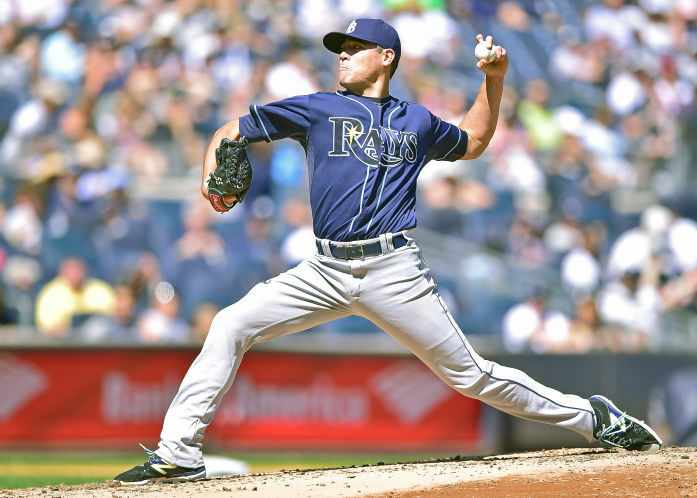 Chris Archer (12-10, 2.78 ERA) will try to continue his dominance against the Yankees, opposite of Ivan Nova (5-7, 4.50) in the series finale. 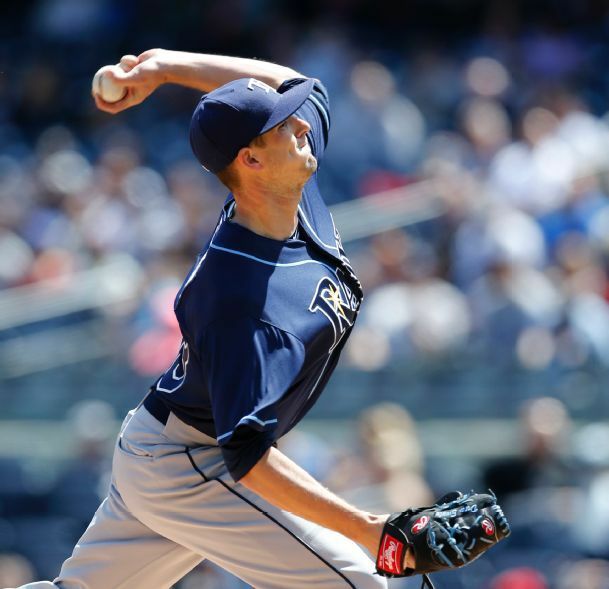 Archer threw six scoreless innings against the Orioles on Monday, making for his 10th start without allowing an earned run (a new team record). He is 5-0 with a 1.78 ERA in eight career starts against the Yankees. Nova will attempt to snap a three-start losing streak. He took a loss in his previous start, allowing three runs on seven hits over six innings. He is 6-6 with a 3.70 ERA in 15 career games (14 starts) against the Rays. You can read about the pitching matchup in our series preview. ― OF Desmond Jennings (knee) and C Curt Casali (hamstring) are reportedly making progress in their rehabs, but no dates are set for their returns. Jennings has yet to try running on the field. OF Steven Souza Jr. (fractured left hand) began the first of (at least) a three-game rehab stint Saturday with Triple-A Durham. 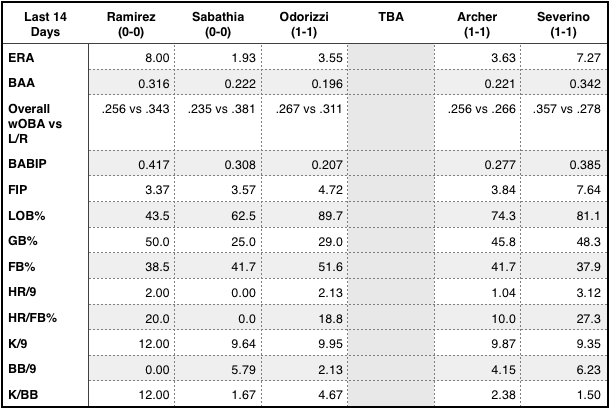 As of now, it appears less likely that LHP Blake Snell will get called up after Durham’s season ends Monday, although Tampa Bay could use another middle infielder, with Jake Elmore, Nick Franklin and utility man Taylor Motter (who would have to be added to the 40-man roster) all being possibilities. RHP Andrew Bellatti could rejoin the bullpen. ― Heads up, the pre-order window closes this afternoon. Order now while they’re still just $10!